I ordered my men to fire and the reports were almost simultaneous. 2nd Lieut. James D. Mann, 7th Cavalry, in camp at Fort Riley, Kansas, 1888. On December 28, 1890, First Lieutenant James D. Mann, K Troop 7th Cavalry, was left in charge of his battalion’s camp at the Wounded Knee Post Office while his battalion commander, Major S. M. Whitside, rode out with over 240 troopers to meet and capture Big Foot and his band of Miniconjou Lakota. Lieutenant Mann sent the following message at 1:30 p.m. from the cavalry camp to the Assistant Adjutant General of the Department of the Platte headquartered in the field at the Pine Ridge Agency. 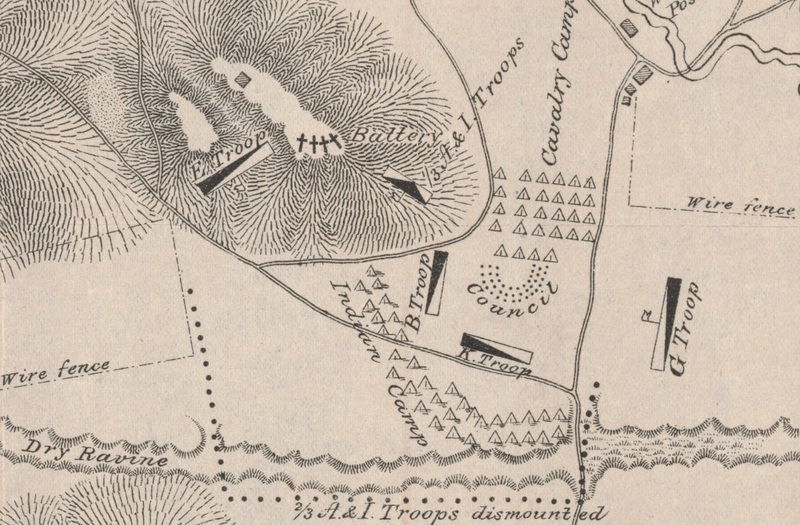 Major Whitside with all mounted men and mountain guns left camp at 12 m. to meet Big Foot’s band, reported to be in camp at the crossing of the Porcupine, having been reported there by Little Bat. We have in camp here two of their men, holding them as prisoners. I have just been informed by Vespucius, a halfbreed, who has driven from the agency to this point, that he met about 50 strange Indians, who were about 9 miles from the agency and heading in that direction. These, I learn from our prisoners, are from Cherry creek and are trying to get into the agency. James D. Mann graduated from the United States Military Academy in 1877 and served with the 7th U.S. Cavalry for over thirteen years. As a thirty-six-year-old platoon leader in K Troop, Lieutenant Mann was in the thick of the fight at the Battle of Wounded Knee, in which his troop commander, Captain George D. Wallace, was killed. The following day Mann was commanding K Troop at the Drexel Mission fight along the White Clay Creek and was wounded in the hip. He was evacuated to Fort Riley, Kansas for recuperation. From his hospital bed, Mann dictated to one of his brothers his account of the battle at Wounded Knee. The night before the fight, the Indians had asked for tents, saying they had not enough tent room, so we put up Wallace’s mess tent and some “Sibleys,” but when we went into them in the morning, there were no evidences of their having been occupied, except Wallace’s, which was occupied by Big Foot, who was sick. The morning of the 29th we started to disarm them, the bucks being formed in a semi-circle in front of the tents. We went through the tents searching for arms, and while this was going on, everyone seemed to be good-natured, and we had no thought of trouble. The enlisted men were not allowed to go inside the tents and only took the arms as we handed them out. The squaws were sitting on bundles concealing guns and other arms. We lifted them as tenderly and treated them as nicely as possible. Had they been the most refined ladies in the land, they could not have been treated with more consideration. The squaws made no resistance, and when we took the arms they seemed to be satisfied. Wallace (Captain George D. Wallace, 7th Cavalry, West Point, ’72) played with the children chucking them under the chin and being as pleasant with them all as could be. He had picked up a stone war club, which he carried with him. I think we got about thirty pieces of various kinds from the tents. As soon as we had finished this search, the squaws began packing up, which was a suspicious sign. During this time the detachments that had been detailed to make the search of the tents had resumed their places, but I had to fill in on the “left,” instead of on the “right,” where I should have been. [This positioning would place Mann nearest the apex of the ‘V’ formed by B and K Troops.] I had a peculiar feeling come over me which I can not describe–some presentiment of trouble–and I told my men to “be ready; there is going to be trouble.” We were only six or eight feet from the Indians, and I ordered my men to “fall back.” I finally got them back about twenty-five feet. Then it seemed that at some signal all the bucks threw off their blankets and drew their weapons. My mind was never clearer than at this moment, and I saw distinctly what was coming. I thought, “The pity of it! What can they be thinking of?” I knew what must be the inevitable consequence to them with so many soldiers present. In front of me were four bucks–three armed with rifles and one with bow and arrows. I drew my revolver and stepped through the line to my place with my detachment. The Indians raised their weapons over their heads to Heaven as if in votive offering, then brought them down to bear on us, the one with the bow and arrow aiming directly at me. Then they seemed to wait an instant. The medicine man threw a handful of dust into the air, put on his war bonnet, and then I heard a gun fired near him. This seemed to be the signal they had been waiting for, and the firing immediately began. I ordered my men to fire, and the reports were almost simultaneous. After the first fire the Indians broke and ran back among their women and children, and some secreted themselves in the tents, keeping up their firing from there. One of them secreted himself in one of the “Sibley” tents and, cutting slits in it, out of which he could see, picked off a number of our men before we could locate him. One of my men, noticing where the shots came from, said: “I will get the ——– out of there” and ran up to the tent. I called to him to “come back,” but he kept on and with his knife slit the tent from top to bottom. Before he could do more, the buck had fired at him. He stepped back and exclaimed, “My God, he has shot me. I am killed. I am killed.” He turned and started to run back to us but, before reaching us, he fell dead. A Hotchkiss gun was brought up, and a couple of shells exploded in the tent. There was no more shooting from there after that, but we did not know whether or not the buck was dead. To avoid the loss of any more men from him, we threw a fire-brand on the tent and burned it down, revealing the buck lying dead. After the battle we found Wallace lying dead in front of a tent with two bullets through his body and a wound on his head, with empty revolver in his hand. I think someone must have reached out of the tent and struck him on the head with a war club after he was down, and possibly it was done with the war club he had been carrying. By this time all the Indians had been killed except a few who had secreted themselves in a gully, and these were dislodged by the Hotchkiss guns. It was during this latter firing that Lieutenant Hawthorne was wounded. I do not see how any disposition of the troops could have been made to have prevented the fight. I have thought over and over about this, and the only thing I can see would have been to place a man behind each buck, with his revolver against the buck’s head, with instructions to shoot if he made the least move, and I doubt if even that would have done any good. This band of Indians was a sullen, hard lot, and they had made up their minds to die. They were crazy with religious frenzy and believed they were going to exterminate the soldiers. Concerning Mann’s wounding on White Clay Creek the day after Wounded Knee, First Lieutenant John C. Gresham provided the following account in an article for Harper’s Weekly just weeks after the two battles. No animal, however shy or watchful, is safe against the quick, stealthy approach of the Sioux Indian. This talent was well illustrated in the wounding of Lieutenant J. D. Mann. He was commanding his troop in skirmish line along a prominent ridge. About a hundred yards to his left and rear, and running from the crest down the slope, was a slight depression, whose existence no one suspected. A few Indians crawled along this, and gave us a volley partly enfilading and partly in reverse. A detachment was sent there at once, but saw no one. Mann was a fine, brave and gallant officer, always ready and willing for service and did his duty cheerfully. There is many a sad heart here to day among the officers and especially among the enlisted, as he was a great favorite of the men, as he always treated them kindly. I will miss poor Mann as I have always been fond of him and appreciated his many good qualities. Word was received here yesterday that Lieutenant James D. Mann of K Troop, Seventh Cavalry, had died from the effects of his wounds received in the fight near the Mission the day after the Wounded Knee affair. Lieutenant Mann is another victim of the ill-fated troop to which the brave Captain Wallace belonged and was engaged at the time of his death in writing a magazine article upon the battle. Mann was a brave and popular officer, making many friends during his short residence here. In Syracuse, Kosciusko County, Indiana, on May 15, 1854, James DeFrees Mann was born to Richard Fleury and Elizabeth (DeFrees) Mann. James’ father, Richard, was born on June 29, 1825, in Farquier County, Virginia, the son of George Mann, Jr., and Elizabeth Floweree. At the age of twenty-four Richard married Elizabeth DeFrees on September 20, 1849, at Elkhart, Indiana. She was the eighteen-year-old daughter of James S. and Mary R. (Frost) DeFrees. Richard and Elizabeth moved to Turkey Creek near Syracuse where he was employed as a clerk. Their first child was a daughter, Mary Regina, who died in her first year of life in 1851. Three years later their first son, James Defrees—the subject of this post—was born in 1854. Their second son, George Richard, was born July 22, 1856, at Goshen, Indiana. George married Caroline Louise Rock (1864-1960) and settled in Little Rock, Arkansas, where he worked as an architect. George and Carrie had three daughters, Elizabeth, Wilhelmina, and Georgia. He died on March 20, 1939, at Little Rock. Richard and Elizabeth were blessed with another daughter, Minnie E., in 1859 but she too did not survive her first year and died in 1860. Their last child, William DeFrees, was born in Middlebury, Indiana, on April 17, 1861. William married Ella Virginia Stambaugh (1862-1924) at Philadelphia in 1899. William and Ella had no children and he died after 1940 likely in Los Angeles, California. In November 1861 Richard DeFrees joined the 48th Indiana Infantry where he served as the Captain of G Company. His Civil war service took him to Paducah, Kentucky, and ultimately to Farmington, Mississippi, where he died of typhoid fever on July 24, 1862. Captain Mann was initially buried in Corinth. Elizabeth eventually had his bodied reinterred in the Oakridge Cemetery at Goshen, Indiana, where the thirty-year-old widow was living with her mother and raising her three boys. (Click to enlarge) James D. Mann as a cadet first sergeant at the United States Military Academy at West Point, New York. Lieutenant Mann was born in Syracuse, Indiana, May 15, 1854. He was appointed a cadet at the United States Military Academy and entered the class which graduated June 15, 1877. He was assigned to the 7th Cavalry and joined his troop, E, at Fort A. Lincoln, North Dakota, October 1st of that year. On July 4th of the next year he accompanied his troop on the march to Bear Butte, S. D., and later in the same summer, on the campaign against the Cheyennes in Dakota and Nebraska. Returning to Bear Butte he remained with his troop in the winter camp which preceded the building of Fort Meade in 1879. He remained on duty at Fort Meade until May, 1882, when he was detailed on special recruiting duty at Jefferson Barracks, Missouri, remaining on that duty until August, 1883. He was then transferred to troop G, stationed at Fort Leavenworth, Kansas. While stationed at that post he took the course in the Infantry and Cavalry School, graduating very high in his class. In 1885 his troop was ordered to Fort Keogh, M. T., for station. Having been ordered from that post to Fort Buford, D. T., to temporarily command troop “F,” he became partially paralyzed from exposure during the trip and never fully recovered, although he continued to zealously perform such duties as came to his lot. 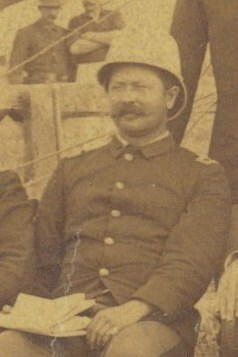 In 1886 his troop, was ordered overland to Fort Meade, S. D., and in 1887 was changed again to Fort Riley Kansas, from which time until his death, Lieutenant Mann continued almost uninterruptedly on duty at this post, performing various staff duties to the entire satisfaction of his superior officers, his aim being to well perform the duties of whatever detail came to him. He was promoted 1st Lieutenant July 22d, 1890, and assigned to troop H, at Fort Sill, I. T., but was transferred to troop K at this post, and accompanied his troop to Pine Ridge, S. D., for duty during the recent Indian troubles. He was engaged with hostile Indians at Wounded Knee, S. D., December 29, 1890, and conducted himself with marked ability and courage. On the following day he took part in the engagement on White Clay Creek, S. D., and while on the skirmish line with his troop, he received the wound which from complications caused his death on January 15, 1891, at 1:15 A.M. Lieutenant Mann gained the respect and esteem of all with whom he was associated. As a mark of respect for the memory of Captain Wallace and Lieutenant Mann, the officers of the regiment will wear the usual badge of mourning on their sabres for the period of thirty days. L. S. McCormick, 1st Lieutenant 7th Cavalry, Adjutant. (Click to enlarge) War Department record of honorable mention of Lieut. James D. Mann, 7th Cavalry for actions at Wounded Knee. Lieut. Mann, 7th Cavalry, was in command of “K” Troop before the search of the Indians began. I gave him instructions to be on the alert, watch the Indians in front of him, and to have the carbines loaded and in readiness to fire. After the firing began, I heard Lieut. Mann’s voice distinctly give the command aim and fire. Other than that I cannot say. The Indians when they broke rushed through his troop and Captain Varnum’s. Lieut. Mann’s conduct at that time was cool and deliberate. It was a position of great danger. At the end of 1891 the Commanding General of the Army, Major General John M. Schofield, recognized a number of officers and soldiers who distinguished themselves during the Pine Ridge Campaign of 1890 – 1891. Lieutenant Mann, thanks to Major Whitside’s testimony, was listed among these soldiers. The Major General Commanding takes pleasure in publishing in orders to the Army the names of the following officers and enlisted men who, during the year 1890 and in the recent campaign in South Dakota, distinguished themselves by “specially meritorious acts or conduct”: December 30, 1890. 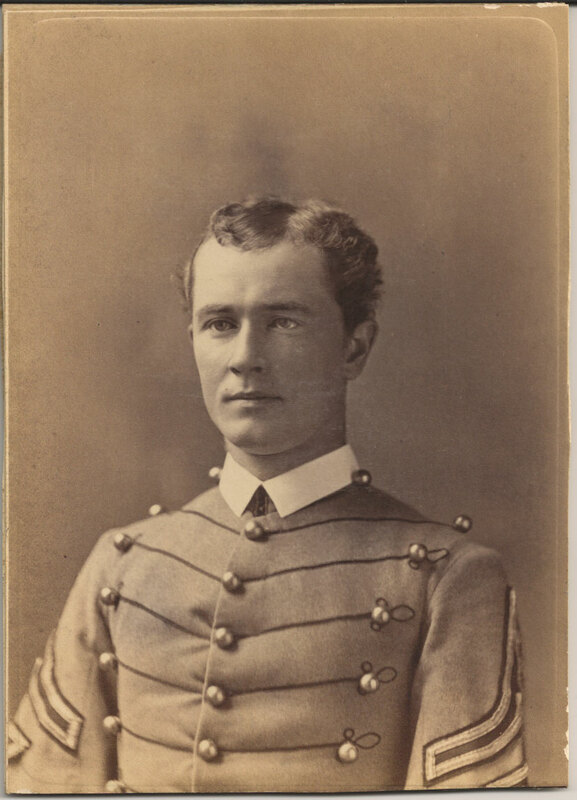 1st Lieutenant James D. Mann, 7th Cavalry (since deceased): For gallantry in action against hostile Sioux Indians, near the Catholic Mission, on White Clay Creek, South Dakota, where he was mortally wounded. On January 7, 1885, James Mann married Kate Leslie Ray, the twenty-four-year-old daughter of A. Ross and Eliza L. Ray of Washington D.C. James and Kate had two sons, Richard Ray and Anson, both born in the Montana Territory, about 1886. Following his death in January 1891, Lieutenant Mann was buried initially at the Fort Riley Post Cemetery, but his widow had his body exhumed at the end of May that year and re-interred at Arlington National Cemetery. Lieut. James D. Mann’s grave marker at Arlington National Cemetery. Kate Mann moved with the boys back to Washington, D.C. where she was raised. In 1910 her son, Anson, was an Army officer living with her in Washington. By 1918 Mrs. Mann was living in Annapolis, Maryland, with her other son, Richard, his wife Emilie (Spalding) and their son, Richard Leslie. On April 16 of that year Kate Ray Mann died of Apoplexy and was laid to rest with her husband at Arlington. Commander Richard R. Mann, U.S.N., Superintendent of the Asiatic Naval Communication Service, who died here Saturday, was buried with military honors. After a requiem mass was said over his flag-draped coffin in the San Ignacio Church, a destroyer carried the mourners to a point off Corregidor Island, at the entrance to Manila Bay, where the body was lowered into the sea in accordance with the Commander’s wish. For the third generation in a row, a young widow was left to raise a teenage son. This photograph of then Second Lieutenant James D. Mann at Fort Riley was cropped from a larger photograph in the authors private collection. John R. Brooke, Sioux Campaign 1890-91, vols. 1 and 2 (Philadelphia: Historical Society of Pennsylvania, 1919), 603. Inset to “Map No. 3 Scene of the Fight with Big Foot’s Band December 29, 1890, Showing position of troops when first shot was fired, From sketches made by Lt. S. A. Cloman, Acting Engineer Officer Division of the Missouri,” Nelson A. 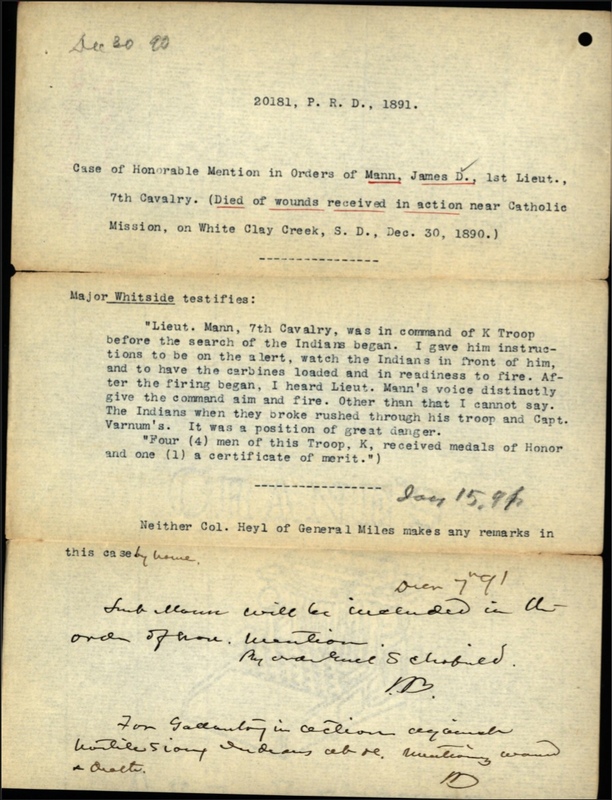 Miles Papers, Sioux War, 1890-1891, Wounded Knee, Pullman Strike, Commanding General, box 4 of 10, repository at the U.S. Army Military History Institute, Carlisle, PA. Photograph of map taken by Samuel L. Russell, copyright Russell Martial Research, 2017. James D. Mann, “Incidents of the ‘Wounded Knee Fight,’ December 29, 1890, as related to his brother by Lieutenant James D. Mann, K Troop, 7th Cavalry,” as quoted by Frazer Arnold in his article “Ghost Dance and Wounded Knee,” The Cavalry Journal, May-June, 1934, (Fort Riley: The United States Cavalry Association), 19-20. John C. Gresham, “The Story of Wounded Knee,” Harper’s Weekly, 35 (February 7, 1891), 106. Kelley, Pine Ridge 1890, 256. 1850 United States Federal Census, Turkey Creek, Kosciusko, Indiana; Indiana Marriages, 1802-1892 [database on-line]; 1860 United States Federal Census, Middlebury, Elkhart, Indiana; 1870 United States Federal Census, Goshen Ward 3, Elkhart, Indiana; 1880 United States Federal Census, Goshen, Elkhart, Indiana; 1900 United States Federal Census, Little Rock Ward 3, Pulaski, Arkansas, and Philadelphia Ward 28, Philadelphia, Pennsylvania; Arkansas Death Index, 1914-1950; 1910 United States Federal Census, Little Rock Ward 2, Pulaski, Arkansas, and Philadelphia Ward 28, Philadelphia, Pennsylvania; 1920 United States Federal Census, Little Rock Ward 2, Pulaski, Arkansas, and Gloucester, Camden, New Jersey; 1930 United States Federal Census, Little Rock, Pulaski, Arkansas, and Los Angeles, Los Angeles, California; Web: Indiana, Find A Grave Index, 1800-2012; 1940 United States Federal Census, San Gabriel, Los Angeles, California; Philadelphia, Pennsylvania, Marriage Index, 1885-1951. U.S., Civil War Soldier Records and Profiles, 1861-1865; Returns from U.S. Military Posts, 1800-1916, Microfilm Serial: M617, Microfilm Roll: 895; Registers of Deaths of Volunteers, compiled 1861–1865, ARC: 656639; The National Cemetery Administration; Union National Cemetery, Regimental Groups, c. 1861-1933; 1870 United States Federal Census, Census Place: Goshen Ward 3, Elkhart, Indiana; Roll: M593_311, Page: 336A, Image: 353, Family History Library Film: 545810. USMA AOG, Twenty-second Annual Reunion of the Association of Graduates of the United States Military Academy at West Point, New York, June 12th, 1891, (Saginaw: Seemann & Peters, Printers and Binders, 1891),49-50. Adjutant General’s Office, Honorable Mention file for First Lieutenant James D. Mann, Principal Record Division, file 3466, Record Group: 94, Stack area: 8W3, Row: 7, Compartment 30, Shelf: 2. Research conducted by Vonnie S. Zullo of The Horse Soldier Research Service. Adjutant General’s Office, General Orders for 1891, G.O. 100 dated 17 Dec. 1891, page 4. Historical Newspapers, Birth, Marriage, & Death Announcements, 1851-2003, The Washington Post (1877-1954); National Archives and Records Administration, Burial Registers of Military Posts and National Cemeteries, compiled ca. 1862-ca. 1960. Samuel L. Russell, “Lieut James DeFrees Mann (1854 – 1891),” FindAGrave, http://www.findagrave.com/cgi-bin/fg.cgi?page=pv&GRid=85294722&PIpi=76691029 accessed 10 Aug 2013. 1910 United States Federal Census, Precinct 8, Washington, District of Columbia; Historical Newspapers, Birth, Marriage, & Death Announcements, 1851-2003, The Washington Post (1877-1954). The 1910 census is the only record the author has found documenting Anson R. Mann. New York Times, 4 Jan. 1925. Citation for this article: Samuel L. Russell, “First Lieutenant James DeFrees Mann, K Troop, 7th Cavalry,” Army at Wounded Knee (Sumter, SC, Savannah, GA, and Carlisle, PA: Russell Martial Research, 2013-2018, http://wp.me/p3NoJy-1k), last updated 30 Dec 2018, accessed date ____________. This entry was posted in Award Recipients, Casualties, Officers and tagged 7th Cavalry Regiment (United States), Battle of Wounded Knee, Cavalry, Died of Wounds, Drexel Mission, Fort Riley, James Mann, United States Military Academy, White Clay Creek, Wounded Knee, Wounded Knee Massacre. Bookmark the permalink. Wonderful work. There is another article by Janice Rasley in the Goshen paper at the time of the 100th roll call of Lt. Mann’s class at West Point. Do you happen to have a copy of the article? Another great job, Sam, and thanks! All the best to you for 2019.